Protect against SPAM and viruses—Make sure you – and your employees know how to detect and deal with suspicious emails so you avoid viruses. 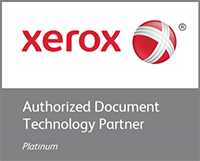 Xerox makes security a top priority because we know it needs to be for you and your business. Every Xerox® ConnectKey® Technology-enabled device such as the VersaLink® C405 Color Multifunction Printer. is armed with a comprehensive four-point approach to printer security to prevent intrusion.